Pinterest, the wonderful social image sharing site, is where I get a lot of great ideas for decor and organizational awesomeness. The first time I saw a loom hung on the wall as art, I just had to try it as soon as I could get myself in a thrift store for super cheep supplies. My L-shaped apartment has one long wall that needed some oomph. My wall consists of several wooden circle looms of various sizes with the largest being 18 inches in diameter (show below as the only loom my grandmother owned). Most of the fabrics I used came from thrift stores as old scarves that had a funky design on them, but a few are cut from old T-shirts I wanted to keep for their designs only, and even a little flag that broke from it's stick. I wanted to spread them out against the entire wall to keep a variety in the sizes (no two the same size right next to each other) and the largest once centered. The designs are easy to swap out if you go down to a smaller loom. Unscrew the loom so there are two circles in front of you (the outside with the screw, and the inside). 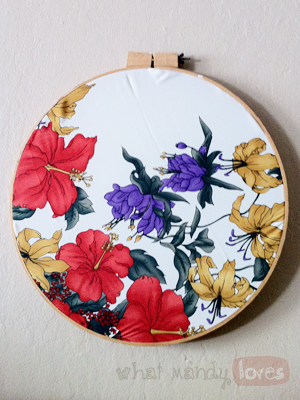 Take the inside hoop and place it underneath the fabric. Position the fabric's design where you want it cut. I like to use patterns that align off-center or up against the edges of the loom. Carefully place the outer loop over the inner loop to hold the fabric in place. You may need to unscrew the outer loom all the way so the fabric does not move. Screw the outer loom on tight but not all the way until the fabric is taunt and in the correct place. Flip the loom over. Use scissors to carefully cut away the access fabric as close to the loom as possible. If your loom is not screwed tight enough, the fabric will bunch or even fall out while cutting so be sure everything is secure. Another way to secure the fabric is to glue the fabric to the back of the inner loom (shown on the first link below) before cutting away the fabric, but either way is cool since nobody's gonna see it. Hold your new wall art against the wall where you wish to hang it. From there, use any ordinary push pin to make a hole. I suggest poking a hole at a slight downward angle if your sewing pins or nails do not have a solid circle at the end. Use the sewing pin to hang the loom on the wall. It's a thin enough pin to go between the screw, is sturdy enough for most looms (even the large 18" loom I have shown in a picture below is hung with one), and it compliments the fabric. Nails also work and will be much sturdier for your peace of mind (and metal looms are the heaviest), but I prefer the sewing pins for appearance and they have held up for me so far). Use these looms as an artistic centerpiece on an empty wall or spread them out to entirely cover a wall (like I did shown above - I kind of went nuts). Hang them close together or spread out. Combine circular looms with oval looms and looms made of different materials and colors. Use similar fabric colors or a particular theme all together (like flowers, stripes, shapes, etc) to match decor. This is a great way to re-purpose old T-shirts, blankets, and other fabric items that you've only kept for sentimental value but have turned to clutter. Have any other links for me? 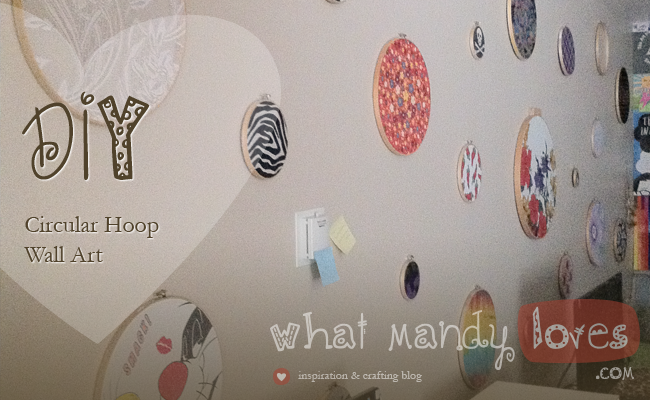 I'll source your blog if you did a post about loom wall art that is not listed here. How have you used looms as wall art? Let me know in the comments.